THANK YOU to our YMCA family for this amazing award! We look forward to everything that this partnership will continue to bring to the community. Last week, two amazing Colin’s Hope Athlete Ambassadors took to Lake Austin with the hope of saving lives. Meredith Terranova and Jaime Slaughter are phenomenal athletes with a passion for water safety. 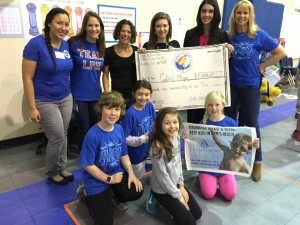 In an effort to raise awareness about drowning prevention, they chose to swim in honor of Colin Holst, Colin’s Hope, and the 65 Texas children who have lost their life to a drowning in 2016. The swimmers kicked off their journey at 6:15am on July 12 after brief interviews with Fox 7 News. Meredith and Jaime spent roughly six hours in the water, ending their journey near 360 bridge. Though they battled some strong wind and whitecap waves, the two Ambassadors took on the challenge with a smile. Colin’s Hope would like to send a special thank you to Meredith and Jaime’s safety crew! These fantastic individuals worked effortlessly to make sure the swim went smoothly, and supported Meredith and Jaime throughout their journey! Read Meredith and Jaime’s stories at www.bestdayever13.com. You can also make a donation to Meredith’s ongoing quest here.